Hi there everyone. My last semester at Binghamton University is coming up and I’m slowly preparing to be pushed out into the working world in an attempt to make a living. My time at this school has been very interesting to say the least. It was kind of like a personal social experiment. I would subject myself to various humiliating or mentally trying situations in order to see my own reaction. And of course I was only aware of it in hindsight, so as to obviously not upset the delicate nature of the experiments. I must say that some of the results were quite informative. Actually, all that I really learned is to not mix large quantities of alcohol and magic. Weird things happen then. My results are also slightly inconclusive on that, because my notes become a bit fuzzy, so actually never mind. To kick off this final semester I have but one amazing song. 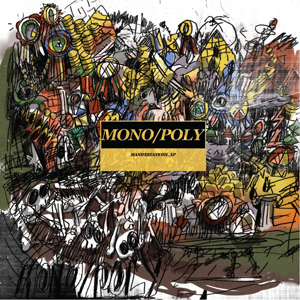 This time it is a song by Mono/Poly entitled “Forest Dark” off of his Manifestations – EP. Signed to Brainfeeder (Flying Lotus’ label), this LA based artist shook the foundation of the experimental trip-hop scene with this 2011 release. The song begins in some rainforest with a deft synthesizer riff that sets a sort of neutral -1 mood. An outstanding setup for what is to follow: a dark explosion of hip-hop madness. Deep pulsating bass lines envelop your brain like slow vibrating tendrils while the main melody of a slowly stuttering synth distracts you. This furious break skyrockets the mood to +8, pretty much right on the cusp of inciting riots. But Mono/Poly realizes this and in order to maintain the mellowness he initiates a sort of descent which creates an entirely unheard effect in the face of hip-hop. Basically the synths from the beginning make a miraculous return to calm everyone down, forgetting that all they really do is just set up another drop. This time it’s even better, with a +9 to face-melting, the retriggering of the different instruments display the advanced level of beat making that this artist is on. Like some giant monster crawling out forest, this song is trying to eat you, but only to regurgitate you so that it can eat you again. Wish me luck as I try to find a job. I think I’m going to actually have to start going to company information meetings. I always thought those were some kind of jokes.